I’ve long been familiar with this title, and especially this debut issue’s cover. Of course, that’s on the surfacey level. Actually READING the thing? I don’t know if I had ever read this. It’s possible that I’d only read a later issue or two, or perhaps only known the character from appearances in other titles (such as Prime and Ultraforce) as well as the Ultraforce cartoon…and of course, I love the design. ’90s though it may be, it’s got something to it that I always liked! 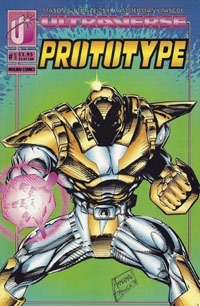 We were actually first exposed to the notion of Prototype back in the pages of Prime #1. One of the news briefs in that issue referenced Prototype being injured and possibly killed, and a statement from Ultratech’s Stanley Leland. As this issue opens, we seem to be getting more info about that particular incident, where Bob Campbell (Prototype) was helping test weapons systems in the armor, and the situation went wrong, costing him his arm, job, and way of life. This opening scene turns out to be a dream/nightmare (rather than "just" flashback) as we find ourselves back in the present with Bob, now with a prosthetic arm, living alone with his cat. We cut to a couple PDAing in the street, when they run afoul of some large, green bulked-up guy screaming about and trying to find Ultratech. As he bellows to Ultratech and Leland that "Glare" is coming, we cut to Leland giving a presentation regarding Prototype…and this includes the NEW Prototype literally bursting onto the scene. While newer, sleeker, and perhaps more powerful, we get hints that this newer armor isn’t truly complete, as it’s still got issues…we also later get hints that it’s also causing its new wearer–Jimmy Ruiz–issues. Leland and his crew make the best of the presentation, despite Campbell trying to make a scene, and then Ruiz having to fly into action against Glare. We get several pages of the new Prototype vs. Glare, and then a mysterious intervention by Leland’s assistant before a crowd around the scene of the battle accuse Prototype of killing the guy. 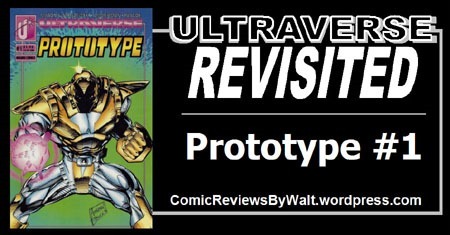 Somewhere along the way, I learned that after the Black September stuff (essentially the Ultraverse‘s "reboot," which happened a couple years into the universe’s existence) the original Prototype, Bob Campbell, was Prototype again. Of course, I’d only really known Jimmy Ruiz, and as I type this, off the top of my head I can only really think that was due to Prime #4 and Ultraforce stuff. Seeing Campbell get more involvement in this issue makes me suspect he was a more important (and perhaps rounded) character than I’d thought. It’s also likely that somehow he was blended in my mind–in part–with Justin Hammer and the scene of Hammer’s failed attempts of duplicating Tony Stark’s armor in Iron Man 2. This issue drops us into some action right away while contextualizing and expanding on the blurb we’d gotten in Prime #1. We see Campbell and where he is now/what his life is like; then we get the introduction of a villain-figure, move to the introduction of the new Prototype, while getting the seeds of some likely problems to come; we see how Campbell is treated by his former employer, we get to see the new Prototype in action beyond the "staged" stuff, and we’re left with a cliffhanger and to wonder where the kid stands on the matter of killing an opponent, wanting to be a superhero, his lack of training, etc. In short, we’re introduced to key players, given context and development, and left with something to bring us back for a second issue. Visually, this is a solid issue; I enjoyed it overall, and would really have to dig to find stuff I’d be able to cite as a problem. 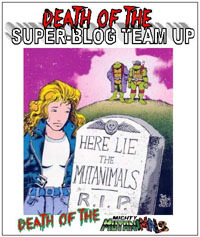 This is–and looks like–a ’90s comics (considering it IS one, that’s to be expected!). Probably one of the more standout elements to me is the design of the two Prototype armors–Bob Campbell’s, and the one worn by Jimmy Ruiz. The Campbell armor is large and bulky–an easy comparison for me is to the Iron Man "Hulkbuster" armor; while the Ruiz armor is a very sleek and slim "Iron Man Lite" armor that looks like pieces of armor on a skintight bodysuit. This felt like reading a new issue for the first time…at most, I suspect this would be the second time I’ve actually read the issue. And for it feeling like the first time, it was a good issue. Since this is the first issue…it’s of course a great one to start with, to jump in on…and if you like Iron Man for the cool armor and tech stuff, this is definitely an issue to grab from a bargain bin! Heck, this is one that would be worth getting from a bargain bin for the cover alone, if you’re of a mind to display comics. I look forward to reading the subsequent issues of this title and getting more context for the characters involved…all the more as I know the character crosses over with Prime "next month" in the fourth issue of that series. This is well worth 25-50 cents, and since it’s a first issue, if you’re curious about the character, I’d say even $1 is not bad to start at the beginning with this character!